WASHINGTON — Pope Francis has named Bishop Charles C. Thompson of Evansville, Indiana, to lead the Archdiocese of Indianapolis. Archbishop-designate Thompson, who has been Evansville’s bishop since 2011, will succeed Cardinal Joseph W. Tobin, who was named to head the Archdiocese of Newark, New Jersey, last November. Archbishop Christophe Pierre, apostolic nuncio to the United States, made the announcement in Washington June 13. Archbishop-designate Thompson, 56, served as pastor of Holy Trinity Church and vicar general of the Louisville Archdiocese until he was named Bishop of Evansville. 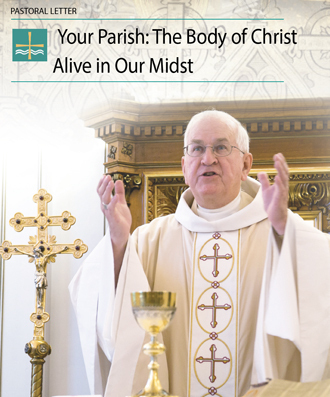 On the national level, he is a member of the U.S. Conference of Catholic Bishops’ Administrative Committee, the Committee on Priorities and Plans, and the Committee on Clergy, Consecrated Life and Vocations. “I pledge to dedicate myself to you without hesitation or reservation,” Archbishop-designate Thompson told the people of the Indianapolis Archdiocese at a news conference June 13. He said he had been “humbled and honored” by Pope Benedict XVI naming him to Evansville and feels that way yet again with Pope Francis appointing him to Indianapolis. “I cannot begin to fully express my deepest gratitude and affection for those with whom I have served in the Diocese of Evansville,” the archbishop said. “These past six years, I have been very blessed to serve with such wonderful priests, deacons, religious, lay colleagues and, most especially, a great mentor and brother” in retired Bishop Gerald A. Gettelfinger, whom he succeeded in Evansville. “Archbishop-designate Thompson has served with great distinction as a very caring, pastoral, and humble servant of Jesus Christ for the past six years as Bishop of Evansville, Indiana,” the Archbishop of Louisville noted. “He is a hard worker and a person who always seeks the path of holiness for himself and for those with whom he serves. Archbishop-designate Thompson was known as “Father Chuck” when he served as a priest of the Archdiocese of Louisville and spent his childhood in Marion County, Ky. He is the eldest of Coleman and Joyce Thompson’s three children. He was ordained a priest of the Archdiocese of Louisville in 1987 and served as associate pastor of the Basilica of St. Joseph Proto-Cathedral from 1987 to 1990. He became part-time associate pastor of St. Francis of Assisi Church from 1992 to 1993 and was appointed Metropolitan Judicial Vicar and Director of Tribunals from 1993 to 1998. During those years, he also served as administrator of the former St. Peter Claver Church from 1994 to 1996. He was appointed pastor of St. Augustine Church in Lebanon, Ky., in 1996 and became pastor of Holy Trinity Church in Louisville in 2002. In 2008, Archbishop Joseph E. Kurtz appointed him vicar general of the archdiocese while he continued to serve as pastor of Holy Trinity. Other assignments included serving as temporary administrator and presbyteral moderator at several parishes, as well as priest-chaplain at the following high schools: Bethlehem High School in Bardstown from 1987-1990, Presentation Academy from 1995 to 1997 and Sacred Heart Academy from 2004 to the present. He also served as a visiting professor of canon law at Saint Meinrad School of Theology from 2002 to 2011. The archbishop-designate holds a bachelor of arts degree in accounting from Bellarmine University, a master of divinity degree from St. Meinrad School of Theology in Southern Indiana and a licentiate in canon law from St. Paul University in Ottawa, Ontario. At the news conference, he noted that during his seminary formation and education at St. Meinrad School of Theology, now-retired Indianapolis Archbishop Daniel M. Buechlein, a Benedictine, was his seminary rector. Archbishop-designate Thompson added that he is happy to be staying in Indiana to continue to be part of the Indiana Catholic Conference and to serve with “such wonderful brother bishops” in the state — Bishops Kevin C. Rhoades of Fort Wayne-South Bend, Tim H. Doherty of Lafayette and Don J. Hying of Gary, Bishop Gettelfinger and retired Bishops William L. Higi of Lafayette and Dale J. Melczek of Gary. “Drawing on my episcopal motto, ‘Christ the Cornerstone,’ it is my first and foremost prayer that we be Christ-centered in all aspects of our identity, mission and witness in proclaiming the joy of the Gospel,” Archbishop-designate Thompson said. Sacred Heart Academy students Gabriella Floro, Zoe Hert and Kathleen Blim have been selected for the 2017 Governor’s Scholars Program.